Hold onto your hats as one fearless woman redefines heroism in the perilous arena of international espionage. With equal parts brains, beauty and brawn, Marvel’s Agent Carter on ABC ignites a firestorm of adventure, suspense and action-packed fun integral to the origins of the Marvel Cinematic Universe. In 1946, top SSR (Strategic Scientific Reserve) operative Peggy Carter (Hayley Atwell) is still reeling from the loss of Steve Rogers (a.k.a., Captain America). But now that the war is over, peacetime deals her yet another blow as she finds herself marginalized when the men return home from fighting abroad. Now her “missions” consist of fetching coffee and answering phones—until old acquaintance Howard Stark (Dominic Cooper) is framed for selling his deadliest weapons to the highest bidder, and he contacts the one person he trusts to clear his name: Agent Carter. Working as a secret double agent with the aid of Stark’s butler, Edwin Jarvis (James D’Arcy), Peggy must evade both her SSR colleagues and mysterious foreign assassins as she attempts to track down those responsible and dispose of the weapons before they inflict mass destruction. 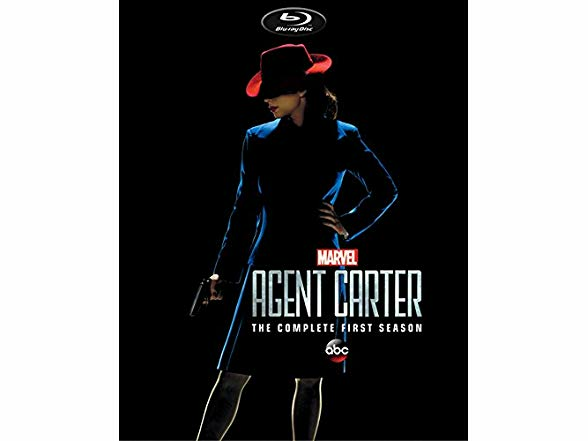 Relive all the glamour and excitement of Marvel’s Agent Carter: The Complete First Season with this must-own Blu-rayTM set that will transport you to a by-gone era full of modern-day thrills. Units may or may not come with a slipcover.